Big Blue's Online Carburetor: Big Blue is home! Tonight, EP and I drove up to Valley Wagonworks and picked up Big Blue. It was our first time driving him since purchasing him almost 2 months ago. Paul did some fine work, and the engine runs strong and quiet (even though we topped out at 57 on the highway on the ride home). Tomorrow we take him camping up in Napa! 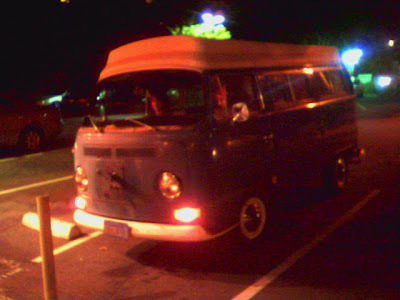 Here is a picture from my phone of Big Blue in the parking lot of Tommy's Wok in Sausalito. Could you tell that he was happy to be mobile again?